Hello Jet Setters! We're back from a few in Atlantic City at The Revel Resort. We were there for a little r&r and to celebrate our anniversary! I will have more on our trip next week, but for now I wanted to talk about one of my favorite pieces of clothing for travel or everyday- a white jacket. Even in the spring and summer, living in the northeast, you always need an extra layer for cool days and nights. I absolutely love a denim jacket, but a white jacket adds a crisp, clean look to any outfit; be it a t-shirt and jeans or a maxi dress. I got this jacket at Anthropologie, and have worn it when we traveled to Texas last month, and brought it to Atlantic City too. The material is so soft, plus the white is nice to show off a tan. 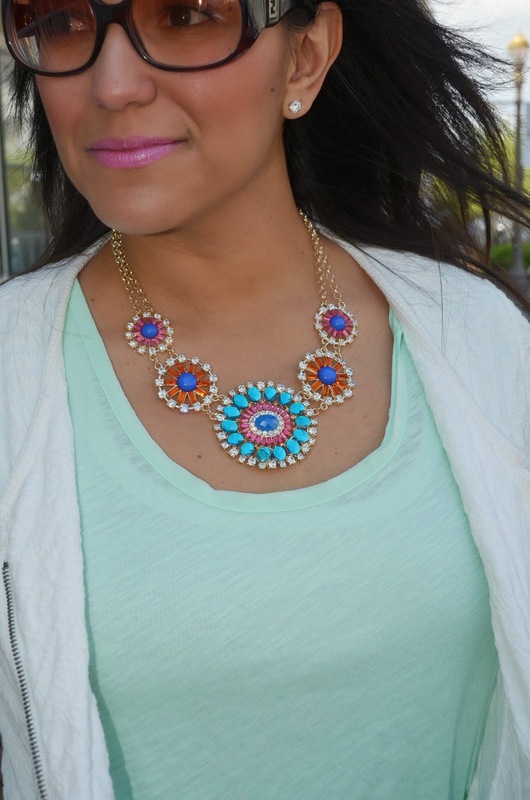 I also added fun pops of colors with my Anthro shirt and clutch, fun neon Target sandals, and this gorgeous Sira & Mara necklace that was sent to me for being "Fan of the Month!" Happy Friday everyone!